There is rather a mystery surrounding the Question: How many crystallographic forms, or allotropes, of Carbon exist? The information below is a sampling of opinions. We invite your vote on the topic. Carbon Nanotubes (CNT) is the material lying between fullerenes and graphite as a new member of carbon allotropes. The study of CNT has gradually become more and more independent from that of fullerenes. As a novel carbon material, CNTs will be far more useful and important than fullerenes from a practical point of view, in that they will be directly related to an ample field of ``nanotechnology''. Until recently, the element carbon was believed to exhibit only two main allotropic forms, diamond and graphite. Research in the US and Europe has now confirmed the existence of a third previously unknown form - buckminsterfullerene ( C60 ) and its relatives, the fullerenes ( C24, C28, C32, C70 etc ). Carbon has two basic structures: Graphite, with sp2 bonding, and Diamond, with sp3 bonding. Related structures include hexagonal diamond, and several compounds. This is related to the hcp (A3) lattice in the same way that diamond (A4) is related to the fcc lattice (A1). It can also be obtained from Wurtzite (B4) by replacing both the Zn and S atoms by Carbon. Transformation path in the pressure-induced conversion of graphite into diamond... The two simulation cells adopted contain 48 and 64 carbon atoms, described by a state-of-the-art LDA pseudopotential scheme. Within a few ps simulation time, and under increasing pressure, a spontaneous conversion from the initial hexagonal graphite to a final diamond structure is obtained. We find that the conversion path proceeds trough a preliminary sliding of the graphite planes into an orthorhombic stacking wherefrom an abrupt collapse and buckling of the planes leads to both cubic and hexagonal (Lonsdaleite) forms of diamond in comparable proportions. Diamond, allotrope of carbon, forming colorless cubic crystals. Diamond is the hardest known substance, with a Mohs hardness of 10, which varies slightly with the orientation of the crystal. Thus diamonds can be cut only by other diamonds. They do not conduct electricity, but conduct heat extremely well. Diamond burns when heated in air to 900C; in an inert atmosphere it reverts to graphite slowly at 1000C, rapidly at 1700C. This includes Chaoite, a (claimed) allotrope. Fullerenes are the third stable allotrope of carbon (besides graphite and diamond) and were first discovered in molecular beam experiments in 1985. This won the team of scientists involved the 1996 Nobel prize in chemistry for the discovery of C60 . (Harold W. Kroto, Robert F. Curl and Richard E. Smalley. You're confused? What about Polymorphs? Are they allotropes? Synthetic diamonds tend to be rather yellow. Synthetic diamonds are the hardest material with good physical and chemical properties of very high compressive and corrosion resistance. They are widely used in machine, metallurgy, oil, geology, building materials, electron, instrument and meter, national defense industry and frontiers of technology. crystal which, I believe, was the upshot of an accidental discovery at (?) Arizona State in about (?) 1985. On page 153 there are three photomicrographs, at three different magnifications, showing the result of mixing benzene with C60-rich soot and applying heat. The two upper ones are much alike; maximum magnification, say, 1500X. the third one is electron microscope picture, and appears to be about ten times as big, or 15,000X ... don't be fooled by the indicated scale, which suggests that 1mm ~ 1nm (nanometer), which would make the crystal as it appears, about 2 nm thick. But the crystal is obviously very dense, and as the diameter of the C60 itself is about One nm, the scale in the picture must be off. My thesis is regarding the interaction between the C60 and the C6H6. It is possible to select four sites, tetrahedrally symmetrical, on the C60. 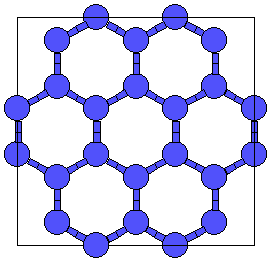 Each site is a hexagon, surrounded by three hexagons and three pentagons alternating. At the central hexagon, unhook all six carbons and insert six additional. This will make an outward-pointing opening surrounded by three hexagons and three heptagons, alternating. Repeat the process for the other three sites and you have the C84 molecule. These interconnect to form the crystal best shown in the lower photo on page 153. Reaction? §C60 + 4§(C6H6) + heat > §C84 + 12§H2 maybe. One more thing: the C84 molecule as described above is chiral, and each molecule must be connected to one of opposite "twist." I have tried several times to push this idea and have never had any response. I don't know if already old news, or if there are patent rights involved or what. Anyway, if this interests you I will send you a stereogram of the C84 crystal: just give me a postal address. This web page is a great idea. I thought I was the only one who was confused. 12-15 years ago I remember hearing something about a "fourth carbon" called "carbyne". I wish I could remember were I saw that. In between the perfect forms you have listed are a large variety of carbon structures each having distinct physical properties different from graphite, amorphous carbon, diamond, fullerines, and lonsdaleite. I call these allotropic forms because their higher order structure has not adequately been described by simple combinations of the above structures. If these are not allotropic forms what are they and what should we call them? First consider the variation of Chemical Vapor Deposited (CVD) Graphite which has a turbostratic form (hexagonal with kinks) that varies in density and degree of order with deposition temperature (900 - 2000 C). One form of CVD carbon rings like a bell is very hard and is bright silver in color. Other different and unusual "phases" can be obtained by CVD deposition onto diamond powder. Next consider the large variety of structures found in carbon fibers. Nobody said allotropic forms must be natural. These structures depend on the precursor and processing. Certainly these complex 3 dimensional structures do not fit into any of your listed forms. The most commons precursors are Rayon, PAN and Pitch. All yield different fibers, with various structures, densities and mechanical properties. It is interesting to decide how to classify higher order structures not based on crystallographic unit cells or total randomness. Finally somewhere in between glassy carbon and fullerines is the remainder of the class of structures based on soot and carbon blacks. These materials have unique properties. Because of there individual and agglomerated structure of the soots and carbon blacks they have properties vastly different than glassy carbon. According to my dictionary, which is not very technical, an allotrope has different properties with the same composition. Even in the world of polycrystalline graphite, different grades have different properties. Actually, I really feel there are only two allotropes; SP2 bonded (hexagonal) and SP3 bonded (tetragonal). It also seems that you should make a distinction between HOPG (highly ordered pyrolytic graphite or single crystal graphite) and polycrystalline synthetic graphite which is what most people call 'graphite'. There are also fibers, where the crystallographic planes are tubular and layered like an onion. Although these have different properties, I do not consider them allotropes. About 15 years ago, I read the LBNL produced a true 'white' graphite that had unique properties, but I was never able to get more information on it. Also be aware that many people refer to boron nitride as 'white graphite'. After I E-mailed my vote, I decided you might want this excerpt from a paper I did for a Semiconductor meeting. I converted it to rich text format, so it may be a little scrambled. for More Than 4 Allotropes. Please indicate which they are!